As part of a test for removing legacy protocols from the network I disabled NetBIOS over TCP/IP to see if any system would be adversely affected. After disabling NetBIOS for the server used by our Fuji-Xeros ApeosPort-II 4000 Photocopier, the Network Scanning feature was unable to upload the scanned file to the SMB server. Instead it would return a 027-516 error code. To verify the problem I Enabled NetBIOS and it immediately started working again. I contacted Fuji-Xerox to check if they had a fix for the problem. I was advised that this can only be changed in newer versions, ApeosPort >=3, and that is was considered a “Feature”. The only way for an AP-II device to work with a server with NetBIOS disabled is to use the FTP transmit method. After checking on one of our ApeosPort-III C3300, I found the page mentioned that allows the setting to be changed. 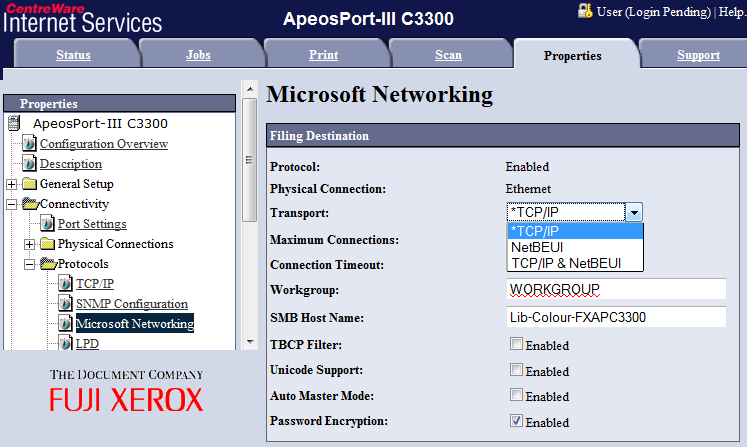 This entry was posted in Windows and tagged ApeosPort-II, ApeosPort-III, fuji xerox, NetBIOS, netbios over tcp ip, Photocopier, smb server. Bookmark the permalink.